Let’s face it. There are a TON of things to take into consideration when you’re putting together a nursery. And some things are way more fun to think about than others. Or perhaps you're in the throes of infancy and things aren't going quite as planned... Either way, one of the things that is often overlooked is nursery organization. I know, I know, dry and boring. 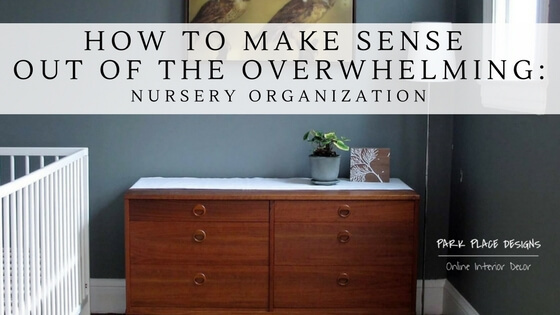 But a well-organized nursery can make everyone’s life so much easier. Promise. Let me show you. Put yourself in each area of the nursery. Okay, you’re at the changing table, what do you need within reach? In the rocker? What do you need there? Think of each little area as a zone of the larger room and then figure out what you need for that zone and where it makes sense to put things. Nurseries are small rooms; zones will overlap. This is good because you want the zones of the rocker and crib to overlap when it’s the middle of the night and you’re ready to lay baby down! If you’re stuck, a couple of common “zones” are: crib area, diaper changing area, rocking/cuddling area, toys, closet, book area. The ideal storage plan for any room is a mixture of closed and open storage. Closed storage is just what it sounds like. Storage that is closed off in some way. Maybe this is a lidded box or a dresser with drawers. Basically it’s out of sight, but not out of mind. It’s great for diaper changing stuff, extra bedding, etc. Open storage is, you guessed it, open. Although it’s tempting to hide everything away for a super tidy nursery, it isn’t going to work. Baby will want to explore and SHOULD explore. Plan on having some things for them to investigate. Try to incorporate a mixture of textures, colors, etc. Remember, the more they are entertained, the less likely they are to go looking for adventure (and mostly likely finding it where you don’t want it!). Organizing horizontally is pretty easy. Put some bins next to the bookcase and you’re good. And you are, but you’re missing out on a big opportunity if you stop there. Use the wall space you’ve got to add shelving and hooks (hooks are an entertainment all to themselves with little guys). Consider a tall dresser in addition to your shorter changing table size. And take a look in your closet!!! If you leave yourself with clothes hanging and that’s it you’re giving up valuable storage “real estate”. More on closets later. An over the door organizer like this one utilizes some easily-ignored door space, too! Now that we’re getting specific, let’s start here, because arguably this is where you need to be the most organized. You don’t want to be caught with a squirmy wormy, a poopy diaper and clean diapers across the room. No good. You want everything you need in arm’s reach. And I do mean “arm” because you’ll need to keep one hand on baby at all times. A couple of popular places to keep all the diaper gear is in drawers under the diaper changing table, hanging off of the table or using wall space for storage. Key point to keep in mind: it has to be out of reach of curious hands. I used a dresser as a changing table for both of my boys and it worked great. All my supplies were stashed away in the top drawer, easily accessible and it doubled as storage for clothes, bedding, and other things. To keep it extra safe, I installed those drawer locks that provided that little extra challenge to yanking them open. We all know that you’ve got a bar for hanging clothes and a shelf above that most likely. Right? Sure! But think how much more you could store if you double that. Put a second rail for hanging clothes below and store out of season clothes there. Add shelves all the way to the top of the closet and add more seasonal stuff. Can’t reach it that well? You don’t need to! Grab a chair when you need to get the snowsuit. The rest of the time it’s out of the way and that’s all. good. If you’re short on floor space, you can place your dresser in the closet too. Take off the hanging bar (or move it up, out of your way) and you could even have a changing “room” that you can close off if you want. Long story short, consider your closet a major part of your nursery especially when it comes to storage. Divide baby’s clothes as much as you can. Maybe this looks like all the long-sleeved shirts together in the closet next to the bunch of short sleeved. Or maybe it looks like drawer dividers in a drawer. Regardless, the less you (the sleep-deprived, groggy parent) have to hunt around for what you need the better. Only have the stuff you really need (and use) available. All the other stuff (like the onesies that are 6mos ahead of now) get it up on those closet shelves and out of your way. But please, please, please label them! It’s such a pain to have three different boxes of baby clothes you’re sorting through when you just need a bigger pair of pants! Get your essentials in the basket and keep it filled up. All you need right at your fingertips! Target. If you have yet to bathe a baby, believe me, it’s slippery, and baby will often be screaming mad and in a bathroom, where sound echoes. Like the diaper changing area mentioned earlier, you want to be prepared. Think back to college and get a little bath caddy so that you can grab and go. Put everything in it you’ll need, but it will probably be less than you think. Shampoo, washcloth, soap, towel. The essentials. Anything other than that can be tackled once you get slippery squirming babykins back to where you can put him down for a second and then lather him up with lotion. Also very slippery. Bedding, burp cloths and blankets, oh, my! This is something that’s perfect for open storage. You’ll need easy access to it, but it’s in no way the end of the world if junior pulls everything out. Aside from open storage, my advice is just to have lots of clean linens available. You’ll go through a ton. And when you find yourself in the middle of the night with a baby who’s had a blowout in the crib, you’ll be glad you have those extra crib sheets in reach. And the wet wipes. One last word on organization, and this is less about storage and more about your sanity. If baby has a special lovey, or stuffie or binkie, for that matter, have. multiples. And have them in many rooms and know where that secret stash is! The truth is that there will come a time where you won’t have the time or energy to hunt down Baby Bunny and it’s for everyone’s benefit that his brother or cousin is right next door. That’s kind of a lot to throw at you, but please believe me when I say I share this because I love you and because it will actually make (this aspect of) your life easier. It’s not perfect! But the little things matter. Like marshmallows in hot chocolate and nursery organization. in the interest of making things as easy as possible for you, here's a checklist of all the goodies discussed above. for free. click here!